It is often said that a pizza a day is always a good idea. It sure can keep heartbreaks and woes away too. But who wants to eat pizzas at the same place when there are countless restaurants in the town that make different (And awesome) pizzas. So, here's our list of the best in town. How many have you tried? Known for its Italian-only cuisine, Flying Spaghetti Monster (in Banjara Hills and Jubilee Hills) is a popular spot for dates. The pizzas are thin crust, and with each bite, you will find a little bit of Rome in it. Our favourites are the Casa and Sicilla pizzas, and they do have a good variety of shrimp, bacon, fish, and chicken varieties. This cafe in Film Nagar is almost new and killing like a pro. You can try a mix of two pizzas and we recommend a mix of Fungi-E-Pollo and Verdure Mist. These thin crust pizzas come with thick cheese and chunks of tangy chicken. Can't ask for anything better! 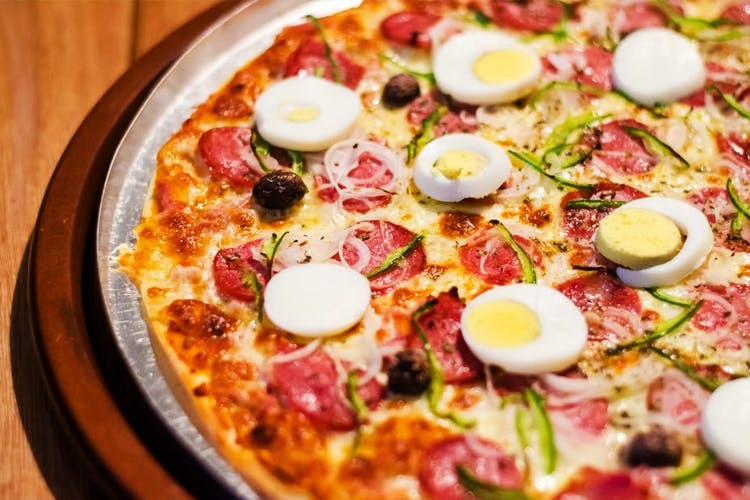 Known for its Bohemian and free-spirited ambience, this cafe in Jubilee Hills has a fantastic range of pizzas. We recommend the Pizza By Flames which is woodfired with vodka, rum, or gin. Ask for the rum one and walk into a pizza mania! We mean it when we say it. The Hoppery (And of course, Olive Bistro) has some of the best pizzas in town. Expect whacky but delicious ones in the form of Everything Seafood Pizza or Chorizo Meets Asparagus Pizza. No matter what your choice of pizza is, pair it with a glass of wine or fresh brew, and your evening is sorted. Probably one of the oldest and first pocket-friendly spot to introduce woodfired thin crust pizzas, we've all grown up on Mama Mia's pizzas. We vouch for the Peri Peri Chicken pizza and simple Margherita (You can never go wrong with it) and if you are visiting with your squad, try their chicken bruschettas too. Go all the way out with an All Meat Pizza that has bacon, chicken, and lamb meat. This is a haven for all the meat lovers, and the pizza has goat cheese for the base, making it an amazing treat.